Robert MacArthur is an entrepreneur, educator, and champion for our environment. He is founder and CEO of SoliPoints, a loyalty shopping platform that offers consumer rewards while helping to reduce our carbon footprint. Shoppers use the Soli app, linked to their credit or debit cards, to shop and earn points, which can be redeemed for cash or gifts. Every point earned/dollar spent also pays to retire 2 pounds of CO2 from the atmosphere by purchasing and retiring carbon credits (or, “permits to pollute” by industry). As an extension of his entrepreneurial interests (he is also the founder and Chairman of Confluent Energies and several other environment-focused companies), Robert is Executive in Residence at Boston University. In this role, he is a mentor and teacher of business incubation and entrepreneurship. Robert is passionate about the BU Startup Accelerator, a student-run organization that provides an optimal environment for students and alumni to build their startups. 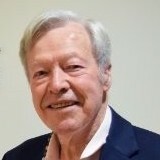 Robert has been associated with BU for more than 42 years. A former adjunct professor, he taught classes in Management of New Enterprises and Marketing for nearly 38 years. Robert himself was educated at Harvard Business School and St. Lawrence University. At 94 years old, Robert, who leans toward being one of the senior Treehouse members, sends up this passionate ASK: That we not pass on our climate change mistakes to the next generation. As for food preferences, Robert says he likes all food, except for poutine, which he deems unfit for human consumption. I’m with you on poutine, Bob. I can’t imagine eating it.